At its core, it seems so simple. Marketing automation is, quite easily, the process of automating parts of your marketing efforts. But once you begin to peel back the layers, it becomes much more complex. Almost every part of your marketing strategy and implementation can now be automated. Should it be? That’s an entirely different question. The fit is natural for some aspects, such as automated follow-up emails to new leads and customers. For others, such as machine learning-based reports and Chatbots, it’s more complex. Yet others, such as creative content development, only tangentially benefit from the concept. And yet, marketing automation is increasingly becoming a core part of business processes today. Almost 80% of top-performing businesses have been using it for two or more years. That’s because on average, they tend to generate almost twice as many leads as those who use non-automated alternatives. That alone makes the philosophy a natural fit for any business and industry. Still, its complexity deserves further discussion. Just what is marketing automation, and what are the ways it can benefit your organization? Consider this your overview of the concept, an introduction that can lead to further deep dives depending on your needs. Email Marketing is probably the most commonly considered topic within this larger concept. Automating your email efforts means scheduling and segmenting individual messages that are unique and specific to each customer, their needs, and their stage in the buyer’s journey. Think automated messages for holiday events, birthday messages, or “we miss you” reminders to prevent customer churn. Social Media Management. As vital as social media is to modern marketing, it’s also time-intensive. Networks like Twitter require 15 or more updates every day for maximum engagement. Through marketing automation, you can schedule these updates in advance or share them easily across multiple platforms. You can also set up automated responses to message inquiries. Analytics and ROI. Set up your CRM to automatically record and present data on your customers and their behaviors. The result is real-time information on the success of your campaign and its individual channels according to a variety of metrics. To achieve optimum results, it makes sense to align your marketing and sales automation. That means bringing your customer journey full circle: track your audience from the first time they see one of your messages to the time they become a customer and beyond. 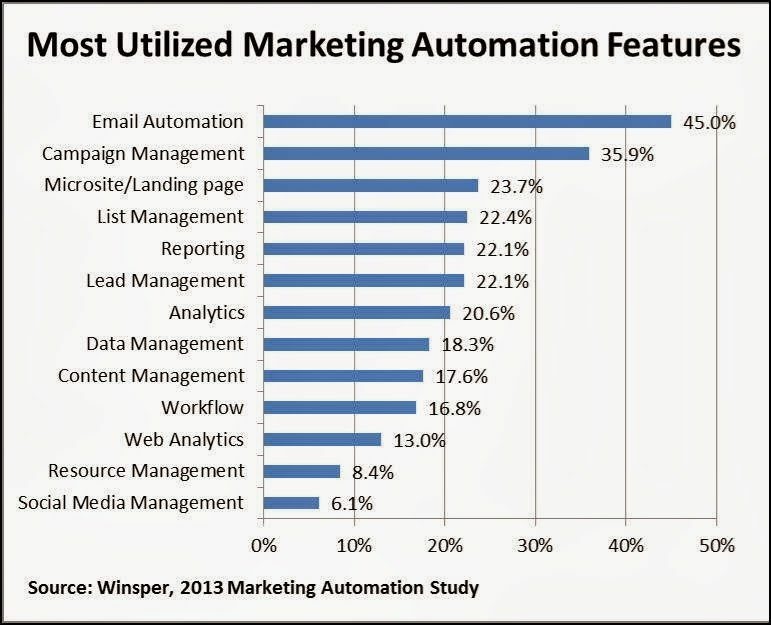 ""67% of marketing leaders currently use a marketing automation platform. "​"
As you begin to align your marketing and sales efforts, you will at some point reach the smarketing stage. This is the point where both focal areas intersect. Build common objectives for both teams, working on a constant information exchange to maximize your opportunities. Built the right way, smarketing can grow your business significantly. Through marketing automation, you can generate higher-quality leads. These leads can be more easily nurtured through the sales funnel with automated emails, while scoring ensures that only the most likely to buy actually make it through to your sales team. Both teams can share a single CRM system that ensures comprehensive information about each lead-turned-customer. That means not just more informed nurturing strategies, but a sales pitch that aligns with and builds on your marketing messaging. Once you start talking about smarketing, you begin to realize that in reality, marketing and sales automation share many of the same concepts. Often based on the same software, sales automation works for you by helping sales agents better determine who the best prospects are, and how to communicate with these prospects. You can integrate both ideas into a single, overarching sales and marketing plan. Sales agents should spend their time selling, not focused on administrative tasks. Once you begin to automate your reporting, lead scoring, and other regular sales tasks, you can accomplish that goal. Integration of both sales and marketing automation concepts into a single CRM system means better reporting, from the first time a lead learns about you to the time they become a repeat customer. So make sales automation work for you, and you optimize and improve the workflow for your entire team in both areas. Want a free e-book? We’ve put together a great e-book titled “Marketing Automation – Multiplying your marketing productivity for maximum efficiency”. Click on the link below to download it. All of the above, of course, sounds great in theory – but will be difficult to execute if you don’t have the right technology in hand. To truly leverages marketing and automation in both areas, you need marketing automation software that saves you both time and money. That means comprehensive capabilities. HubSpot might be the perfect example of that ideal. Rather than focusing on email services with some extra features, the platform is a comprehensive marketing automation suite. The suite’s ability to track your users from the first contact to the final conversion makes it an ideal option to align your marketing and sales efforts. Other options include Ontraport, ActiveCampaign, and MailChimp. Which of these is right for you? The answer ultimately depends on your individual needs and marketing goals. But the basic point remains: to get the most out of marketing automation, finding the right software should be an early and important consideration. With the right software in hand, it’s time to start building your actual strategy. In modern industry, that tends to start with the right content. You might have heard of content marketing. A concept that at its core describes the effort to build and share valuable, relevant content to your audience for free. It focuses on the customer, allowing you to create content specifically designed to answer pain points at various stages in the buyer’s journey. It provides valuable information to your audience for free, increasing your credibility and audience perceptions of your brand. It boosts your brand awareness, particularly when the content is good enough to be picked up and shared by other publishers. It sets up a trust system, in which your audience becomes more likely to believe your messaging going forward after reading quality content. It builds your authority within the industry you occupy, positioning your brand as an expert among both your target audience and your competitors. Content marketing is valuable for these reasons and tends to be especially effective in generating leads. Of course, that step can only be possible if you integrate it into a larger inbound marketing framework. "47% of buyers viewed 3-5 pieces of content before engaging with a sales rep."
What if, instead of having to find your audience, they would come to you? With the right content, they will. But simply reading your blog posts is not enough. Ideally, that content needs to be embedded in an automated framework designed to not just attract attention, but convert that attention into leads and sales. That’s how inbound marketing is changing the marketing game today. In short, it flips traditional promotional methods on their head. Rather than pushing promotional messages to unsuspecting audiences, you pull them in with highly valuable content on your website. Long-form content, such as webinars, white-papers, or newsletters, are free, but behind a sign-up page. When they’re valuable enough, you can use this type of content to generate high-quality, organic leads. Every piece of the digital marketing puzzle should contribute to one or more of these four goals. It’s no surprise, then, that generating qualified leads is a core part of the strategy. "97% of marketers are using prescriptive content, or content that outlines a formula for success." Within an inbound marketing framework, great content drives new leads. Unfortunately, new leads are not necessarily qualified. That’s where marketing automation kicks in. Automated emails can help you get the right messages to the right people, at exactly the right time in the buyer’s journey and lead nurturing efforts driving toward lead conversions to customers. Through automation, you can build a comprehensive inbound marketing strategy that attracts, nurtures, and converts leads into long-term customers. To leverage marketing automation to generate qualified leads, you have to use inbound marketing to draw visitors to your website and generate new leads. Once they’re there, build the right email automation to nurture them toward better qualification and a higher likelihood to buy. "Companies that automate lead management see a 10% or more bump in revenue in 6-9 months time." The welcome email. Acknowledge your new leads, as soon as possible after they sign up. Make your email marketing efforts responsive with more relevant content, and your conversions will increase significantly. Registering VIP members. If you can track who among your leads are repeat buyers or inquiries, give them special treatment. Rewards, loyalty points, and exclusive offers can help them stay engaged with your brand. Segmentation based on purchasing. The more finely targeted your emails are, the more relevant your audience will find them. Segment based on demographics, product type, purchasing patterns, and more. Targeting less engaged customers. There comes a time when every customer begins to drop off. Preempt that time by building specific automation workflows for customers who you haven’t heard from in a while, prompting them to return. Customer experience and relationships. Focus on building long-term relationships with your customers through emails featuring content, news, product reviews, photos, social engagement and more. Choosing the right CRM tool. Find software like HubSpot, which allows you to accomplish all of the above. That includes segmentation, detailed tracking, and more. Used the right way, building these emails has a tangible impact on your sales strategy. More specifically, the right marketing automation strategy can play a major part in increasing sales and growing your business. Whether you want to capture lost sales in abandoned shopping carts or increase your sales through product suggestions, build the strategy you need to maximize your opportunities. Content to drive leads, and email to drive customer conversions. But how do you know any of that actually works? Data-driven marketing has to be your long-term answer to that question. "Nearly half (47%) of marketers say they sometimes test alternate subject lines to optimize email performance." Imagine a world in which you always know exactly how to judge and evaluate every piece of your promotional efforts. That, in essence, is data-driven marketing. Through the right automation software, you can build your strategy for real-time analytics and improvements. First, create an inventory for your content. Track anything from the title and type to metadata like keywords and content URL. Then, define and document your metrics, according to the specific goals you have set for both individual pieces and your larger marketing strategy. Analyze your data according to these metrics, and make improvements where needed. Then, begin to automate your data-driven marketing results. That means conducting dynamic A/B tests that test different versions of the same content to random segments of your audience, collecting data on which outperforms the other. It also means automating your reports, finding out anything from top-performing calls to action to highest converting content. The more you measure, the more improvements you will be able to make to your automation and digital marketing efforts in general. "39% of marketers say proving the ROI of their marketing activities is their top marketing challenge." So far, we’ve discussed the current state of automation. But of course, that doesn’t mean it will always remain stagnant. If anything, the future of automated digital marketing is even brighter. Consider chatbots as an example. More consumers prefer communication via social media, which is where chatbots tend to live. Chatbots can fuel your social media ad campaigns, providing the opportunity for dynamic, real-time follow up after the initial ad exposure. The technology allows you to build relationships with your followers, who are able to communicate and receive feedback even outside of business hours or available personnel. Chatbots can become key to customer retention, following up with existing buyers to amplify anything from cross-selling to customer service. There’s a reason that the chatbot industry is expected to explode over the next few years. Consider it the newest addition to marketing automation, a field that always changes and improves for maximum marketing success. "By 2020, more than 80 percent of businesses are expected to have a chatbot."